Carl Froch unified the IBF and WBA super middleweight titles as he defeated Danish five-time champion Mikkel Kessler via a unanimous points decision. In a thrilling and often brutal contest at London’s O2 Arena, Froch’s greater punch output and willingness to walk through walls, proved crucial as he gained revenge for his Danish foe’s victory in Herning three years ago. The Nottingham fighter recorded ringside scores of 116-112, 118-110 and 115-113 in a fight that could have swung either way before Froch found an extra gear in the closing stages. 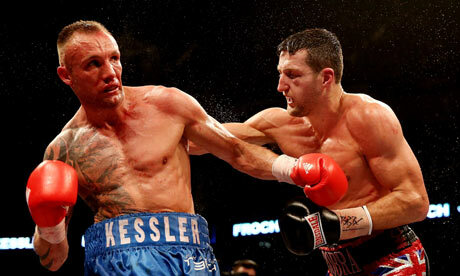 Kessler, who had mentioned his surprise at the length of Froch’s arms during their previous meeting, was forced to absorb countless jabs in the opening stanza as Froch- often famed for failing to start quickly enough- captured the first two sessions with relative ease. The Danish king woke up through the middle rounds- prepared to take punishment in order to land on Froch’s seemingly indestructible chin. Froch seemed in trouble in the sixth, however had his foe in peril in both the eighth and twelfth rounds as the duo exchanged heavy-handed blows. Despite the fact that neither man had been authentically stopped in their careers, it was a wonder that both were able to stand to the final bell. The victory gives Froch his long-awaited redemption and may set up an autumn bout with pound for pound contender Andre Ward. For Kessler, the fight may mark the end of a career than has seen only three defeats; one each at the hands of Ward and Froch and that 2007 unification battle with Joe Calzaghe.